Gregg Drinnan with a copy of the book he co-authored. The picture on the cover of Gregg Drinnan’s book about the 1986 Swift Current Broncos says it all. At the top is a colour photograph of the WHL team hoisting the 1989 Memorial Cup. Below it is a black and white picture of the bus accident that killed four of the Broncos’ players three years earlier. 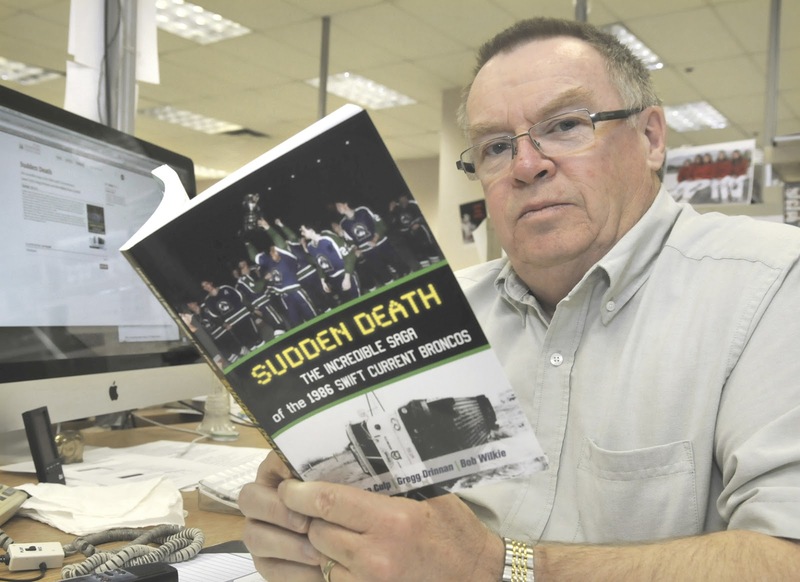 “It’s the story of the players,” Drinnan, sports editor at The Daily News, said of Sudden Death: The Incredible Saga of the 1986 Swift Current Broncos. The book, due in stores Saturday, Nov. 10, provides insight into the team and its struggles to persevere following the tragedy, he said. But it also reveals a side of coach Graham James that many people might not know, said Drinnan, who was assistant sports editor at the Regina Leader-Post at the time of the accident. “If you read the book and don’t know anything about Graham James and what happened with him, you’d think this is a very angry hockey coach,” he said. Although it wasn’t known at the time, James was a sexual predator who victimized at least two of the young players. As a sports reporter, Drinnan interviewed James numerous times during that period. He said James had two sides, the media-savvy coach that was always good for a quote and the volatile man behind the scenes. At the time, sexual exploitation of children wasn’t reported in the news. Looking back, James’s behaviour can be seen in a new light, said Drinnan. Drinnan was approached by Leesa Culp and Bob Wilkie four years ago with a rough manuscript that eventually became Sudden Death. Culp had been travelling in a vehicle behind the bus when the accident occurred. Wilkie is a former player with the Swift Current Broncos. “I thought there was something there. I thought it was a story certainly worth telling,” said Drinnan. Drinnan will sign copies of Sudden Death at the Coles bookstore in Aberdeen Mall from 2 p.m. to 4 p.m. on Nov. 10. The book retails for $25.99.